...it was immediately apparent that the boys and girls do have separate uniforms. I began to whine and asked my mother why she'd enrolled me at a mixed girl's school. “What's that?” I whined, not really wanting to know the answer. My sister, seemingly loving my squirming asked if I meant 'adolescence' or 'petticoat discipline'. “I know what adolescent means.” I stated. Julia started to explain what petticoat discipline is, but Mum took over. “It's nothing to worry about, although it will feel strange at first.” she said. “And it'll only be for school.” she added. “You won't be petticoated all the time.” she insisted. That didn't make it sound any better. I returned my gaze to the web page and read the additional information; white socks, black shoes with heels, make-up! “Your skirt's loads nicer than mine.” my sister moaned. “No it isn't!” I retorted. “I won't have to wear make-up too will I?” I asked, gulping and almost swallowing my jaw in the process. “You will when you start year ten.” Mum replied, tapping on the screen and the words that stated this. “It is optional in year eight.” my sister noted. “Well in that case I'll opt out.” I stated. “I think it's nice.” Mum replied. The winter uniform is a pinafore dress worn with a long sleeved shirt; blue plaid for the boys and brown plaid for the girls. Unlike the skirts which appear to me mid thigh length, the pinafores look like they're closer to knee length. “They look nice and warm.” Mum added. “Long pants would be warmer.” I murmured. The very thought of having to dress as a girl for school sent shivers down my spine. “I'll freeze to death in winter.” I claimed. “You'll have warm woolly tights in winter Matty.” Mum told me. “I'm not wearing tights!” I insisted. The next page showed the PE kit and that didn't look much better than the uniform. “Gym knickers!” I blurted. 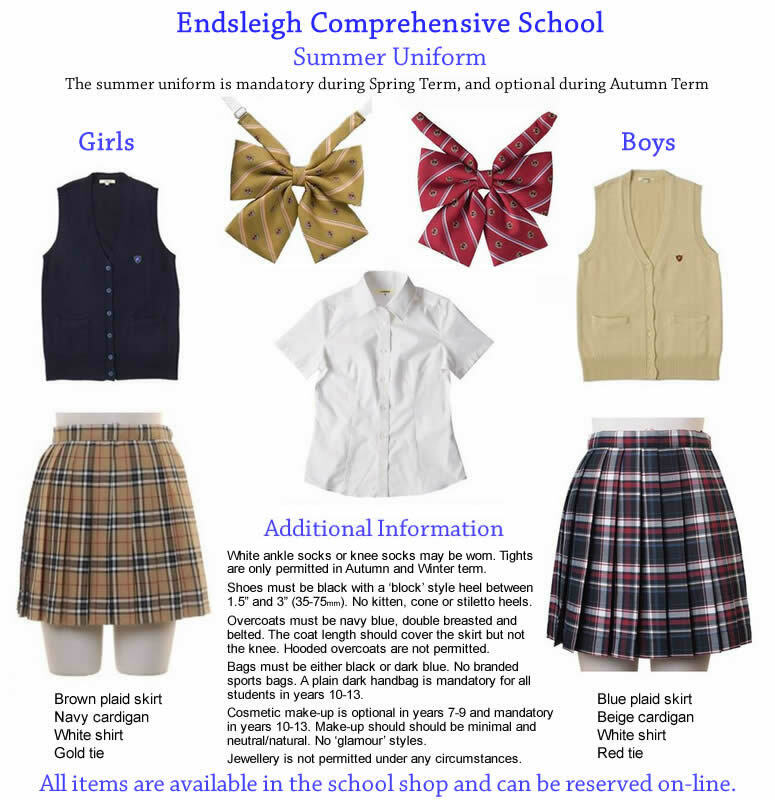 The PE kit consisted of a bottle green skirt, a burgundy polo short, bottle green gym knickers, burgundy knee socks and black plimsolls. The girl's PE kit is reversed having a burgundy skirt and a bottle green top. “Oh we don't have to wear a swimming costume too do we? !” I whined as Mum scrolled down to the swimwear section. The boys wear a green swimsuit and the girls wear a burgundy one. “You never know, you might like it once you've got used to it.” Mum said as she turned to me. Her face held a discomforting smile. “I doubt it.” I groaned. “It's not really Burberry.” Mum said. “It's near enough.” Julia insisted. “Why couldn't you send me to a normal school?” I asked. “Because 'normal' schools are way down in the league tables.” Mum replied. I sighed and slumped into my shoulders. “I don't want to move now.” I moaned. Our mother works from home as a consultant and decided to sell our house in Kent and move north to Derbyshire. With the huge difference in house prices, the move north meant that Mum would be mortgage free and would also have a good lump sum in the bank. We'd been to the Peak District on holiday so the prospect of living close to its southern edge and the legendary Alton Towers theme park was met positively by both myself and my sister... until today that is. “It's still a girl's uniform though... and a girl's school.” I reminded her. I felt a lump growing in my throat. “That doesn't make it any better.” I frowned, before practically begging my sister not to tell anyone. The last thing I want is to spend my last few weeks with everyone knowing the truth about my new school. Julia agreed to keep quiet, and to the best of my knowledge she kept her word. The day of the move was very hectic. The removal men did most of the lifting but there was still plenty for Julia and I to do, mostly cleaning each room once they were emptied. It felt like the end of an era as Mum locked the door for the last time and handed the keys to the estate agent. The drive to Endsleigh would take about three to four hours depending on traffic. We listened to a variety of local radio stations and Mum made the usual small talk. “So how you feeling about starting your new school Matthew?” she asked. “I'm dreading it.” I replied. “At least you don't have to wear Burberry like me!” Julia said. I expressed that it doesn't really matter what colour, pattern or print the uniform has, but the fact that I’m a boy who's going to have to dress like a girl does. “I'll never get used to it!” I insisted after Mum claimed I would. “Hmmm.” I groaned. A measly week and a half isn't long enough, and the more time I can spend not thinking about it, the better. “Is that our removals van?” I asked as we approached an identical vehicle to the one that all our belongings were loaded into. “I think it is.” Mum said as we overtook it. We arrived at the new house long before the removals van did. We unpacked the car and much to Mum's surprise, Julia and I didn't argue over who'd have which bedroom. I liked the view from the little back bedroom window as it overlooked the large back garden and the allotments beyond. We had a good nosey around whilst we waited for the removals van to arrive. In the garage we found bit and bats of old and broken furniture, a few old tools, numerous bits of wood, god knows how many half empty paint pots, a rickety old stepladder and a variety of broken and unbroken plant pots. Mum suggested we have an explore around the local streets and whilst we're at it, find a shop and buy some milk so she can have a cup of tea. We'd had a nosey at the area on Google Maps so had a good idea where the nearby shops were, although translating what we could recall from the aerial view to ground level proved somewhat tricky. After a few wrong turns we eventually found the small row of shops on; newsagent, bakery, hairdressers and a haberdashers. We bought the milk and returned to our new house. The removals van still hadn't turned up but Mum had called them and they expected to arrive in about half an hour. “So what do you think?” Mum asked. The removals van arrived and we got busy helping to unload it. The removals men took all the big heavy stuff and we took things like chairs and other smaller items. The van was unloaded in no time and as it drove off, we were faced with a mountain of boxes to unpack. This kept us busy right through the weekend but come Easter Monday, we were pretty much straight and getting settled in. Some of the neighbours had made themselves know and they seemed nice enough. An old couple opposite had grown up children who'd long flown the nest and the house next door had a three year old and a six year old. From what we could tell, there's only Julia and I on the small cul-de-sac of high school age. The other households seem to be professional childless couples, young families and middle/old aged people. Mum found an old swing ball pole in the garage, but we needed a couple of tennis rackets before we could have a go. On Tuesday we went into the town centre with a view to source said tennis rackets. But Mum had other purchases in mind too... our school uniforms! On the upside, Julia had warmed to the Burberry-esque skirt once she'd tried one on. On the downside, I found myself trying on several skirts before the correct length was found, that being somewhere between the tips of my thumbs and the end of my fingers. Thankfully I didn't have to try any of the PE kit for size, apart from the plimsolls of course, but them came the shoes. The lady in the shop recommended a pair of black lace-up brogues with a chunky 2½” heel which she claimed are popular with the boys. I baulked at the hight of the heel and Mum felt they were a little too high for me. “He's not used to heels so I think the lowest we can get away with would be better.” Mum suggested. I agreed with her thinking, but the lower heeled shoes they have in my size also have a T strap and a shiny silver buckle. I wasn't given a choice and Mum's main concern was that they fit, which they did. Whilst I was moaning about the shoes my sister was trying on the pinafore dresses. Like the skirts, the length is quite strict as it must fall between one and three inches above the knee. Julia moaned that it was too daggy and fit like a sack. Mum told her it wasn't a fashion parade and reminded her that she won't be wearing it for months anyway. Then I had to go through the shame of getting a boy's pinafore that's the right size and length. I now know what Julia meant when she said it felt like a sack... it does, but at least it's not short like the skirts are... and I think I do prefer my blue plaid to Julia's brown. Thankfully the ordeal was over, or so I thought. We left the uniform suppliers with a large carrier bag in one hand and smaller one (containing our footwear) in the other. Mum wanted us both try on our new uniforms when we arrived home. “Oh Mu-um!” I whined. “Can't we play swing ball for a bit?” I suggested, brandishing the pair of tennis rackets we'd found in a charity shop. Mum said we could, but after we'd taken our things up stairs. “Do we have to put them away too?” I asked. “Well... at least hang your skirts and pinafores up ...and you can leave the rest 'til later.” she said. “This is all getting a bit too real.” I said to my sister as we climbed the stairs. “I'm dreading next Monday.” I added. At the top of the stairs we went our separate ways. I removed the three skirts and two pinafore dresses from the big carrier bag and left everything else inside. Mum had already left some of those clippy skirt hangers in my wardrobe, and even clipping my skirts to those was a shameful task. I imagine how it might feel unclipping one every morning and having to step into it! Julia enters as I'm hanging the pinafore up. “It's gonna be weird seeing all the boys dressed as girls.” she said as she peered into my wardrobe. “It's gonna be weirder being one of 'em.” I replied in a mournful tone. We returned down stairs and grabbed a tennis racket each. The swing-ball pole has been waiting in the centre of the lawn for this moment since Mum found it. “I was hoping you might have put your PE kit on.” Mum said, clearly teasing us. We went out to the back garden and did what siblings do best... we got competitive. We played until the light began to fade and by the time we returned indoors, I'd put today's other purchases completely out of my mind. I silently growled when Julia said “I suppose I’d better go and model my uniform.” I silently cheered when Mum said we could wait until after supper. “Well make sure you do.” Mum said. “And I will check.” she assured. My knickers and bras went in with my underpants. My new knee socks went in my sock drawer... apart from one of each item. A single pair of knickers, a white bra and pair of knee socks waited menacingly on my duvet. The thought of having to wear a skirt is one thing... having to wear girl's underwear too is something else. Fearfully, I picked up the training bra. “It's just like a little vest really.” my mother said, pointing out that it doesn't have a back fastening like a 'proper' bra. “You'll have to take your top off first.” she smiled as I stood motionless with it dangling from my trembling fingers. Thankfully, she offered me some privacy and left. Mum returned just as I was about to put a pair of socks on and asked how I was getting on. “I hate it.” I murmured as I pulled the knitted white sock up to my knee and looked in horror at the ghastly pelerine pattern. Mum advised me to make sure the pattern was straight and not twisted as I pulled on the other sock. “Well stand up, let's have a look at you.” Mum said with a smile. I stood and she told me that I don't look 'too bad'. I felt inclined to disagree. “You have got your knickers on too haven't you?” Mum asked. I nodded and mumbled. “Well let's see.” Mum said. “Oh Mu-um!” I moaned. The last thing I wanted to do was lift my skirt to show her my knickers, but that's precisely what she made me do. “You're loving every minute of this aren't you.” I said as I dropped my skirt and looked down at myself. “This is way too short.” I claimed. It's hem landed around the tips of my thumbs and I couldn't help but feel the edge of the many knife pleats with my trembling fingers. Shyly I turned. Mum said I looked 'nice' and told me I'd get plenty of sun on my legs before telling me that my shirt is very smart. “It's a blouse.” I sulked, drawing her attention to the short pin-tucked sleeves and rounded collar. “I suppose it is really.” Mum smiled. She helped me with the tie which fastened at the back and once on, I think I detested that more than the skirt. “Can I take it off now?” I asked. “Can I see it with the cardigan?” she replied. “And your new shoes.” she added. I picked up and donned the cardigan. Mum quizzed whether it was a cardigan or a tank-top as I fumbled with the buttons as like the shirt, they're the wrong way around too. “I think I prefer it without the cardigan... or whatever it is.” I said as I looked down at myself. I'm not a fan of brown at the best of times, especially beige. Mum agreed and said I can always take it off if I get too warm. I fiddled with the buckles of my new school shoes and complained that they were too high. “I'll twist my ankle in these.” I moaned. “That's probably why they make us wear them.” I figured. “Please Mum... no photographs!” I pleaded. Mum said it's a mother's prerogative to take photos of her children in school uniform. I reminded her that she's already got a photo of me in my last school uniform. “I know but I want one of you in this one now.” she replied. I took my first tentative steps in heeled shoes and sheepishly followed my mother downstairs. I moaned and sulked when my sister Julia wolf whistled at me. “Nice legs Matty!” she cooed. Mum stood us next to each over and insisted that we both looked very nice and smart. She took a couple of photos too, which I wasn't happy about. But being vain, my sister Julia wanted one on her own, which prompted Mum to take one of me on my own. I asked if I could finally go and change as Mum reviewed the photographs. “You can change into your pinafore if you want.” she said. “Oh Matty.” Mum retorted, mimicking my tone. Our mother decided that she wanted a photograph of us without our cardigans/tank-tops on, so we unbuttoned and removed them. She took a couple more snaps before handing the camera to Julia so we could have a look. “Oh god... I can't believe I have to wear this in public.” I gulped. I'd not noticed until I saw the photograph that my 'little vest' can be quite clearly seen through the thin fabric of my school shirt. Julia's bra is also visible but she's supposed to wear one so it doesn't matter so much. Maybe I'll slip a t-shirt on beneath it for school. “I know what you mean.” my sister replied. “But I think they call it equality.” she added. “If it's about equality then the girls could wear trousers... it's not as if they don't wear them anyway.” I replied. Julia agreed and said she'd prefer trousers, before claiming that skirts are nice when it's hot. She went to her room and I went to mine. A moment later we met on the landing, each wearing our winter pinafores. Julia sneered at her attire and said she preferred the skirt. “At least this isn't really short though.” I replied. “Do I have to wear this?” Julia sneered as she splayed the dropped box pleated skirt. “Not really.” I moaned, fearing that she'd insist. “But they wear shorts.” I replied. “I can't see why.” I muttered. “It's because boys are less likely to be disruptive in class when they're dressed as girls.” Mum replied. “They're less likely to bully and they don't play truant either.” she added. Wednesday became Thursday and soon it was Friday; the last weekday of the Easter break. On Monday I'll start at my new school and the closer it gets, the more I'm dreading it. On Saturday Mum took Julia and I into town and bought us some new stationary, a school bag and a raincoat each. I feared even the coat would be really girlie but it wasn't too bad I suppose. On Sunday, Mum taught me a new skill... ironing! Up until now, Mum has done all the ironing but from now on I'm expected to iron my own school shirts. To be fair, my sister irons hers so don't have too much cause for complaint. I struggled to sleep that night. What boy wouldn't? “Don't look so worried.” Mum said when I entered the kitchen early on Monday morning wearing my humiliating school uniform. Julia also gave me a few words of support; reminding me that all the boys (and girls) will be wearing similar. After breakfast, Julia popped to the bathroom and Mum took the opportunity to check that I was wearing my knickers. “Good boy.” she grinned after I'd lifted my skirt enough for her to see. “Are you going to drive us?” I asked, hoping she'd say yes. “It'll be fine.” Julia insisted. “It's a normal school, the only difference is your uniform.” she insisted before glancing at my skirt, legs, socks and shoes. “That's a pretty big difference.” I moaned. “You'll get used to it.” she replied, before asking if my legs were cold. “Mine are freezing!” she replied. I glanced at her legs and suggested the reason they're 'freezing' is because she's no hair on them. “Well, you've none on yours either.” she replied. “There's a bit.” I claimed, although admittedly at almost twelve years old, there's not much. “How come you get plain socks and I have to wear these?” I whined. As we got closer to the school, we started to spot other pupils all heading in the same direction. Most wore a dark blue overcoat that concealed their uniform and I found myself wondering if some were long haired boys or short haired girls. Of course there were older pupils too and their gender was obvious due to their size and shape. It hadn't dawned on me before now that I'll still be here when I'm sixteen... almost a man but dressing as girl! I let Julia do all the talking when asking for directions to the school office. We handed over our papers and waited whilst the secretary perused them. A friendly looking teacher exited the staff room, spotted us and knowing that we must be new, introduced himself before asking our names. He asked me if I'd been to a 'petticoating' school before and I shook my head, adding “No Sir” for good measure. I forced a smile and muttered “Hmm.” I gulped. He checked his watch, bid us good luck and said we'd settle in in no time before continuing on his way. I didn't believe him. “Yes Miss.” my sister replied. The teacher introduced himself as Mr Parker and her form teacher. My sister said hello and and he asked her to follow him. “See ya!” Julia said, leaving me alone. “Matthew?” I lady's voice asked. I turned to see a young woman clutching a bundle of books. She introduced herself as my form teacher and asked me to follow her. She seemed pleasant and chatty and I got the feeling she was well liked. As plenty of pupils smiled and greeted her as we walked through the hustle and bustle of the school's corridors. “So what was your last school like?” she asked. “Er... OK.” I replied. “Not really like this one.” I added. Samantha's a girl, obviously. Paul is a boy with boyish hair. Andrew, like George has longer 'girls' hair, Annabel is also a girl, as is Melanie. They tell me about the various teachers, the good and the not so good, the friendly, the strict, and the classes they love or hate. “I can't stand gym!” Andrew says. “I like it.” Paul counters. Samantha agrees with Paul whilst Melanie and Annabel side with Andrew. George is indifferent and states that he prefers sports such as footie and cricket. “I thought it'd be all netball and hockey.” I say. It transpires that they do play netball and hockey too, as well as rugby, lacrosse, basketball, tennis, rounders, athletics and cross country running in the summer. The teacher called me over and I could feel numerous eyes burning into the backs of my legs, my girlie knee socks and my short pleated skirt as I approached her desk. She gave me a time table and told me that George is in all the same classes as me, so if I don't know where I’m going, just follow him. “You'll meet the headmaster before long.” she said. “He's very nice but he's a bit of a stickler.” she added. Her eyes dropped to my feet. I looked down too. “So make sure your socks are pulled up and the patterns are straight.” she advised in a friendly tone with an equally friendly smile. I thanked her and returned to my desk, took my seat and tended to my knee socks before looking at my timetable. “What you got?” Samantha asked. “Double history.” she said, peering at my timetable. “Don't let Miss hear you say that.” Annabel said. “Why?” I dryly asked since it was Miss O'Neill that had told me. “Because she's the history teacher.” Paul informed me. “The Cold War Miss.” Michael replied. “And what can you tell us about the cold war Matthew?” the teacher asked me. “Er...” I began, racking my brains. “It was after world war two, when the Russians and Americans were making nukes.” I said. The double history lesson was mostly discussion rather than copying facts from the board or a book. The class size is about half that at my old school and it felt much more involved than I'm used to. Rather than marking homework and telling us to shush, Miss O'Neil encouraged debate and participation from the entire class. We concentrated on the Cuban Missile crisis but I'd never heard the Russian point of view. Miss O'Neill asked us to consider what we have done under similar circumstances, but had us look at it from both sides. Her teaching was informative, active and very entertaining. I like history at the best of times but never so much as today. “Maths, then French.” she replied. “I'm worse at French than I thought.” she moaned. “Oh hello.” Alice said. She seemed nice, and didn't seem at all bothered that I’m dressed as a girl... but then again, all the boys are. Looking at them all chatting and socialising and being normal, I figured that maybe it isn't as weird as I thought it would be... but it's still quite weird. Especially the ones wearing short girlie hairstyles with headbands, bunches, clips or bobbles. Plenty of 'normal' boys (i.e. short boyish hair) also wore patterned knee socks similar to my own, but some wore those little ankle socks with lacy frills around the cuffs. In comparison to those, my pelerine socks don't seem too bad now... although I'd rather wear plain white knee socks like my sister. “So, what you got next?” Julia asked. George found me shortly before the end of break bell rang and led me to the English class. He didn't seem to have much to say for himself, giving short answers to anything I asked. English has never been my favourite subject and it still isn't. I can't see the point of learning about fiction when there's so much real stuff to learn about. The fact that Mr Clarke seemed obsessed with Shakespeare didn't help. At lunchtime, I sat with my sister and a couple of her new friends whilst we ate our packed lunches. We chatted about where we came from and our old school, the things we could do in our spare time, why we moved house and so on. After lunch I had a double science class followed by maths then geography. As arranged, I met my sister at the school gates and we walked home. “So how did your first day go?” she asked. “OK I guess.” I replied. “It'd be better if I didn't have to wear this though.” I added, gesturing to my short pleated plaid skirt and pale bare legs. “Hmm.” Julia began. “Maybe not.” she said. “How do you work that out?” I asked. “Yeeaah.” I replied with curious caution. “Maybe.” I replied. “...and that's a big maybe.” I added. “So... is Alice your chaperone?” I asked. “Yeah... he's a bit weird... hardly said a word all day.” I told her, before admitting that I thought he was a girl until his boy's uniform registered. We arrived home and Mum was keen to know how we'd both got on. I told her about Miss O'Neill describing the history teacher as a 'dragon', and that she was the history teacher! Mum asked me how I found my uniform. “Well... I hate it but since everyone else wears the same, it's not as bad as I'd expected.” I replied. “In fact, I'm gonna get changed.” I stated. “Ah ah!” Mum said, stopping my exit. “Have you any homework?” she asked. “Ohh.” my sister whined. “Can I at least take this off?” she asked, grabbing the little school tie she wears. “I suppose.” Mum conceded before asking if either of us were hungry. Julia and I sat at the kitchen table and got on with our homework, then an hour or two later when Mum needed the space to prepare the evening meal, she sent us to our respective rooms. I had a bit of a moan because unlike my sister, I haven't got a desk in my room . “There's plenty of room to spread your books out on your bed.” Mum replied before mentioning something about squeezing a table into my small bedroom somehow. Neither myself nor my sister had completed our assignments by the time supper was ready, meaning by the time we had finished and changed into our own clothes, it was almost 7.00pm. Mum had another task for us, and that was to make a copy of our timetables to put on the fridge door. “What for?” I asked. The next day, Tuesday, I did have PE. I was a bit embarrassed in the changing rooms, having to swap my white knickers for my gym knickers, but this can be done without removing my skirt so it wasn't that bad. Saying that, track & field sports in a skirt doesn't seem right; especially the long and high jump. Wednesday was much the same as Monday, although I had a much better idea of where my various classes were held. Drama was more fun than I'd expected it to be. The class is in rehearsal for its end of year play and all the main parts have been cast so I was involved in the set design side of it which put me firmly behind the scenes. “I dunno.” I murmured. “It still feels ridiculous but at least people don't point and laugh at me.” I added. The boys who attend the petticoating school in our home town of Ashford were often ridiculed on their way to and from school, so naturally I expected the same here. Maybe the fact that Endsliegh has two petticoating schools and one 'normal' school makes the difference. Maybe if the Grammar boys tease the rest of us like we teased the Ashford Academy boys, they risk expulsion. Mum told me that I don't look ridiculous and asked why I felt ridiculous. “Well that's obvious innit?” I replied, looking down at my short pleated skirt and pale skinny legs. “It wouldn't feel quite so bad if I didn't have to wear knickers and a bra as well.” I frowned. “And I’d prefer plain socks to these.” I added, kicking out my foot and sneering at my pelerine knee socks. True to her word, Mum came home from town on Saturday with a pack of plain socks for me. “These are ankle socks.” I noticed. “Is that OK?” Mum asked. “I though they'd be a nice change from knee socks.” she said. “Yeah I guess.” I replied. My heart sank a little as she put a cellophane wrapped pack in my hand. “Oh... er... thanks.” I mumbled. They're labelled 'School Knickers' and just like the first pack they state 'Boys: aged 11-12'. Mum suggested that I put them away, and to bring all of my old undies down. “Why?” I asked. “Because you've got plenty of new ones now.” Mum replied. “...and it'll save me having to check whether or not you're wearing your old ones.” she added. Mum said nothing as I handed her my pile of boy's underpants. I loitered as she went through the pile, seemingly counting them. “Good boy... I half expected you to hide a couple of pairs somewhere.” she said. It had crossed my mind, but I had a feeling she'd know exactly how many pairs I have... or had. Mum opened the pedal bin and put the entire bundle in it. My heart sank. “What?” Mum asked as my lower lip swelled. “That means I'll be dresses as a girl even when I'm wearing boy's clothes.” I muttered. “Oh nothing.” I replied, before telling her. “I reckon it's better wearing boys clothes if you're a girl than it is being a boy and wearing girl's.” I suggested. Mum said that thanks to the age old presumption that girls are inferior to boys, then it's understandable that boys don't want to wear girl's clothes. “Girl's aren't inferior.” I stated. Mum smiled and agreed, then claimed that in some ways, girl's are better than boys. “How?” I asked. So far as I've been told, girls & boys, and men & women should be equal. “I'm not going to end up in jail.” I insisted. “Do you think George and Andrew have to dress like girls all the time?” I asked. Mum needed reminding who they were. “The boys in my class with girl's hair.” I said. “I doubt it.” I presumed. “You're probably right.” Mum said as a wry smile swept her face. After a moment she said, “So... these boys... their hair can't be very long because the school rules state that boy's hair should be no longer than the collar.” I described George's hairstyle using my hands and a series of mumbles. “Like a bob?” Mum asked. “A white one?” Mum asked. I nodded. “I might put ribbons in your hair when it's grown a bit.” she suggested. You can guess my reaction. I told her that I didn't want long hair and I certainly don't want ribbons or anything like that in it. Mum didn't reply. I suspected she was only teasing me but I didn't seek clarity in the matter. “What's for tea?” I asked, changing the subject. “Not really... just wondering.” I replied. I felt a bit more at home throughout my second week attending Endsleigh Comprehensive School. However that's because I knew where all my classes were held and was less reliant on George telling me where I needed to be. The uniform still feels wrong but the PE kit isn't quite so bad as the sporty skirt (although short) isn't pleated and the big gym knickers are neither lacy nor frilly. I made few more acquaintances and didn't feel quite so much like a stranger. I also learned that my classmates also have to wear their uniforms at home whilst doing their homework, so I didn't feel quite so hard done by on that front. At home we'd pretty much got the new house arranged in a manner that suited us. We got to know the next door neighbours a little better because my sister played her music too loud and they paid us a visit. They seemed nice enough and I'd rather not hear my sister's taste in music either. We went for a day out in The Peaks and got caught out in the rain which prompted Mum to buy Julia and I an umbrella each. I didn't want an umbrella but since my raincoat doesn't have a hood, I apparently need one. It's one of those compact ones but at least it's black with white spots and not purple & pink like my sisters. Our umbrellas did come in handy during week three when the April showers did what they do best, so much so that I also made sure I put a dry pair of socks in my school bag. In my fourth week we went on a school trip to a stately home, museum and heritage centre near Darly Dale. It would have been better if there wasn't another four or five school trips scheduled for the same day from 'normal' schools. I'd sort of got used to wearing my skirt, but only because all the other boys wear one too. We felt like we were as much on display as the curios in the museum as the kids from other school in other town pointed and whispered, giggled and sniggered at the boys from the sissy school. It wasn't nice but I didn't blame them. I'd have likely done the same back in my home town of Ashford whenever we spotted an Academy boy. Thankfully the tour around the stately home was done one school group at a time. We ate our packed lunches in the grounds, then hung around until our group was called. The tour took us through grand halls and galleries, an elegant dining room, a large lavish library, an ornate bedroom complete with a huge four poster bed. Then they showed us the tiny servants quarters and described how arduous their lives were; starting work at around 5am and working until long after 10pm with only one day off each month. The guide asked for a volunteer and several in our group put their hands up. Becky Jacobs was selected and we watched as she donned all the items of clothing and 18th century maid would wear; chemise, corset, petticoat, shirt, heavy black dress, crisp white apron and finally, a dainty lace hat. 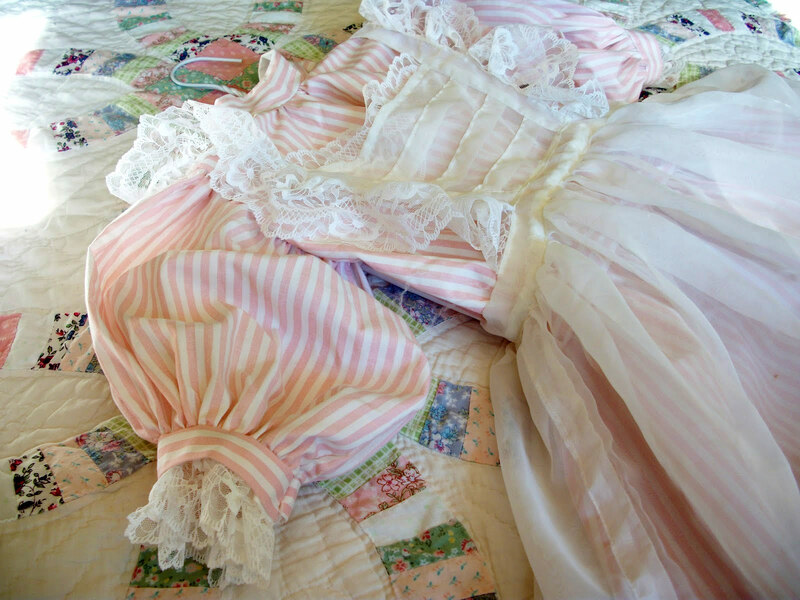 The guide stated that Becky wears the garments of lady's maid; evident by the delicate lace on her apron. Kitchen and scullery maids wore much plainer aprons. Then the duties of a lady's maid were described and another volunteer was asked for. A few of the girls hands went up, but Miss O'Neill suggested that one of the boys could volunteer instead of a girl. None of us did, so she chose me! Just like Becky, I donned a chemise over my school uniform, and this was followed by a corset which Becky laced me into. I complained that it was too tight and the guide said that it's actually quite loose in comparison to how tight they used to be worn. Next came a hooped petticoat, followed by an under petticoat, followed by a tunic, followed by an over petticoat, followed by a big heavy frock and long pair of satin gloves, followed by a thick housecoat and a hat similar to a bonnet. It all weighted a tonne and one of my classmates asked why they wore so much. “Because 18th century houses were very cold and very draughty, especially stately homes like this... they had no central heating, no double glazing, no lightweight and warm modern fabrics... in fact all they had apart from their many layers of clothing were the huge open fireplaces, which the maids would have to keep topped up with hefty buckets of logs or coal, dragged up several flights of stairs.” the guide explained. With me dressed as an 19th century lady and Becky dressed as a lady's maid, Miss O'Neill had us pose for a couple of photographs. I felt stupid but in retrospect, I suppose I got a real insight into the clothing aspect of 19h century life. We were eventually freed from our garments and the tour continued down to the kitchens where life beneath the stairs was described to us. The guide got some of us involved but they didn't have to dress the part. The working farm demonstrated various agricultural tools and techniques from the era as well as shoeing a horse... all in all it was a very interesting day, the only sour point was the derision we received from the other school groups. “Oh er... thanks Miss.” I replied. “When I arrived home, Mum asked me how the day trip was and I told her all about it, including the photo of me and Becky that will be put on the school's website. “Oh let's have a look!” Mum said. “It won't be there yet!” I claimed. Mum checked anyway and low & behold, there it was. With the bonnet covering my short hair, it's hard to tell that I'm a boy, I figured. “Oh don't do that Mum!” I whined. “Why not?” Mum asked as a full colour A4 glossy print slowly shuffled out of the printer. “Because you'll show it to everyone.” I sighed. Mum told me that 'everyone' can see it on the website anyway, before asking after the girl who's dressed as 'my' ladies maid. “That's Becky Jacobs.” I replied, “She's playing the lead in the school play.” I added. Mum asked if I had a part in the play too, but I told her I was helping with the scenery. “Oh that's a shame?” Mum replied. “Oh... a latter came today... from school.” she added. “What about?” I cautiously asked as a letter home can often mean trouble. “Prom week.” Mum said as she fetched the envelope. “Aha.” Mum nodded as she pulled the letter from the envelope. “The last week in June is prom week and each year has their own Prom in the school hall.” she read. “Julia's is on the Wednesday evening and yours is on the Tuesday... and you know what day that is?” she asked with a hint of joy. I shrugged cluelessly, but then thought. “It's your birthday!” Mum announced. I'd never been to a Prom before and to be honest, the concept didn't really gel with me. Mum handed me the letter and I skim read it. Last week of June blah blah, year seven on Monday blah blah year eleven on Friday 6.00pm until 8.00pm, buffet, disco, dance, presentations. “Do we have to go?” I asked. “Well you don't have to go but it is your birthday.” Mum replied. Julia emerged and asked “Have to go were?” Mum told her about prom week and I passed her the letter. Being a girl, she was naturally a lot more excited than I, and reading the letter to the end, she read out a detail that I hadn't noticed. “Students are advised to wear party dresses and girls in years 10-13 may wear ball gowns.” she stated before pining about not being in year ten and therefore is not allowed to wear a ball gown. Mum said there's a fine line between a party dress and ball gown and was sure she'd look lovely anyway. “I wonder what Matty will look like in a party dress?” she said in an almost accusational tone. “I don't 'have' to wear a dress do I?” I whined, before insisting that I wouldn't go if I did. “I don't want to spend it dressed as a girl either.” I sulked. “Because it'll be nice.” Mum claimed. “Like I say, I was only toying with the idea... I was going to ask you first.” she told me. “I wouldn't have just gone and bought you one.” she added. I cast her a pursed smile and said I'd rather not have a dress. “I know but... now you've got a Prom to go to you'll need one.” my mother said as a huge grin swept her face. Of course I instinctively had a further moan about this, but Mum reminded me that all the other boys will be wearing dresses too. Then I light went on in her mind. “I'll bet there's photos from last years Prom on their website.” she said as she began to search the web pages on her laptop. “Oh, show your sister your photo.” Mum suggested. “Wow that looks amazing!” Julia said as she looked at the photo of me in an 18th century dress and my classmate dressed as a lady's maid. I told her how tight the corset felt, and how heavy it was. “There must have been ten layers!” I exclaimed, trying to recall them all. “No we're not... we're just not used to dressing like girls... That's all.” I replied. “Yeah but that doesn't mean I like it.” I retorted. Mum shut the lid of her laptop and said she needed to get the evening meal started. She also volunteered me to help since I had no homework. Julia asked if Mum had found any Prom photos on the schools website. Mum said she had but felt that I'd rather we did something other than talk about dresses... and she's absolutely right. Julia got on with her homework and I peeled the carrots and potatoes. Later that evening, I borrowed the laptop and had a quiet look at the schools website and in particular, the photographs from last year's Prom. I wished I hadn't. All the boys are wearing dresses but unlike the girls, they're wearing the sort of dress that little girls wear, with puffed sleeves, voluminous petticoats and broad satin sashes tied in a big bow at the small of the back. Now I understand the difference between a party dress and ball gown, and why my sister would rather wear one over the other. “They are a bit 'young'.” she replied. “But I think a party dress is more appropriate for a boy than a ball gown.” she added. I suggested that neither are appropriate for a boy. “Oh you know that's not true... you don't mind wearing your uniform these days.” she reminded me. “I do, I just don't complain about it any more.” I replied. “I don't want to wear any of them.” I muttered. She knows that. Why is she even asking? “Are you sure?” Mum asked. I nodded. Mum smiled before suggesting a dark 'midnight' blue or the deep forest green. “I dunno.” I shrugged as I tried to imagine both. “See... now we're getting somewhere.” Mum grinned. A few days later, Mum asked if I'd had another look at last year's prom photos. I hadn't, but Mum had and she'd taken a copy of the photographs showing the dresses that a; she likes and b; she though I might like. I sat beside my mother as she browsed the photos and it wasn't comfortable viewing. She pointed out the colours; a deep green, a dark blue, maroon and claret (both of which were dark red to my untrained eyes), deep purple, dark raspberry (another shade of dark red). “so what do you think?” she asked. “Well they are all party dresses... so by definition they are quite similar.” my mother explained. She drew my attention to minor details such as the shape and style of the neck, the relative height of the waist, matching or contrasting sashes and the various styles of pin-tucked sleeves, puffed sleeves or no sleeves. I wasn't in the mood to even think about it, let alone give Mum the answers she was looking for. “It's important to get an idea of what you'd prefer before we go shopping for one.” Mum told me. The following day at school, I cautiously asked one of my friends if he'd attended last year's Prom and if he'd be attending this year's too. He said yes to both and I asked what he'd be wearing. “Whatever my Mum decides.” he replied. I asked him what he wore last year and he described a ghastly yellow party dress with white spots and a white satin sash. “What do you wanna know for anyway?” he asked. “My Mum wants me to choose my own but I don't know anything about dresses.” I explained. I told him that before I started at Endsleigh Comp, I'd never worn any girl's clothing before and the prospect of shopping for a prom dress is somewhat daunting. “Yeah.” Paul sighed. “It's not fun.” he claimed. “If your Mum's anything like my Mum, she'll just buy you whatever she wants anyway.” he told me, before asking if I have to wear girl's clothes outside of school. I shook my head but said that I have to keep my uniform on until I've completed my homework, although I didn't tell him that I have to wear knickers all of the time. Paul said I was lucky. “Do you?” I asked. He's not what I'd consider one of the 'girlie' boys as like me, he has short boyish hair. Paul nodded. “Not all the time.” he stressed. The next time my mother raised the conversation about my Prom dress, I glumly suggested that I'd leave it up to her, since I don't know anything about girl's clothes. “Just don't get me pink.” I added. “I wear girl's clothes everyday at school.” I muttered. “I know but they're not that 'nice' are they?” my mother said. Although I agreed, I said nothing. Later that evening I overheard my sister and my mother talking in Julia's bedroom. “I thought you liked that dress?” Mum's voice said. I continued to my bedroom and shut the door. A pile of clean laundry lay on my bed. It's mostly whites, so socks, underwear and my school shirts, plus my light coloured T shirts, jogging pants and stonewashed jeans. I began to put them away when I heard a knock on my door. I turned and my mother entered with a bundle of clothes slung over her forearm. I gulped as I noticed some less than desirable prints. Mum smiled and told me that she and Julia had had a bit of a sort out. “Have you got any spare hangers in your wardrobe?” she asked. “A couple.” I reluctantly replied as she laid the items on my bed. “Oh not flowers!” I whined. Mum just smiled at me as she sorted the selection in to what I assume is drawer stuff and wardrobe stuff. “There's some of her old training bras too.” my mother stated as she placed a colourful 'strappy' bundle with my pile of clean laundry. “I'm not allowed to wear those.” I told her. The school rules are quite clear that only white underwear is permitted. “Shorts!” I moaned. Apart from half length cargo pants, I've always hated wearing shorts... and there are short! “Yep.” Mum smiled. “It's not all skirts and dresses.” she told me, holding open a powder-purple long sleeved T shirt with a pink peace symbol printed on it. And just to give it a girlier edge... the symbol is made up from hundreds of tiny love hearts. “That'd be OK if it wasn't for the hearts.” I said. “I had a feeling you'd like it.” Mum grinned. “That's not what I said!” I insisted. My mother smiled as she folded the T shirt and suggested that instead of just 'standing there' I could start putting my things away. She picked up the pile of Julia's old training bras and plonked them in my hands. “Does this mean I have to dress as a girl all the time now?” I reluctantly asked. “Which means a few more choices won't be a huge leap for you.” Mum replied. Mum wanted another photo on the stepping stones. In fact it seemed everybody wanted a photo on the stepping stones which meant a small queue had formed on either side of them. We stopped and sat for a while on the river bank before following the river downstream and back towards Thorpe. We stopped for a pub lunch and afterwards, Julia and I had a game of pool. It was close but as usual, she won. When we got back to the car, Mum asked me if we'd had a nice afternoon. I had but would have preferred it if she'd let me wear 'normal' clothes. I cited the little girl who's 'outed' me at the stepping stones as one embarrassing moment. Mum smiled and told me that her mother thought I was a girl. “No she didn't.” I claimed. Whether I'd rather be seen as a boy in girl's clothes or be mistaken for a girl, I really don't know. When we arrived home I asked Mum if I could change but she felt that there's no point. Julia challenged me to a game of swingball and since she'd beat me on the pool table, I felt inclined to settle the score. “Do you really hate wearing girl's clothes?” she asked as we began. “I bet she makes you wear one tomorrow.” Julia replied. “Because when we were sorting out my old clothes, she said something about you having a 'Sunday dress'.. and tomorrow's Sunday.” Julia replied. “You'll get used to it.” Julia told me. “That's what I'm afraid of.” I replied. “They're only clothes Matthew.” Julia stated. “Nothing to be afraid of.” she shrugged. “So I don't have to wear one tomorrow?” I asked. “I haven't got any plans.” Mum replied before asking us if there's anything we'd like to do. “Not really.” I replied. Julia had more of less the same idea as me. “You could both give me hand clearing out the garage.” Mum suggested. “OK.” I said. If one thing will guarantee me not having to wear a sodding dress for the day, it's clearing out the garage. The following morning we got started on clearing out the garage. We filled the car with the old paint pots and broken flat packed furniture that the previous owners had left behind and took it to the local tip. All the 'good' wood we put to one side as that could be burned and Mum sorted all the plant pots and talked dreamily about having a potting shed one day. “Is this going to the tip Mum?” Julia asked, finding an old desk behind all the old chipboard panels. “Erm...” Mum mused as she wiped the dust from it. “...maybe it'll fit in Matty's room.” she said. “You could do with a desk.” she added. The desk was put to one side as we continued loading the car for its second tip run. Mum gave me a damp cloth to wipe the desk down with and I noticed that it has four holes in the top and pointed them out to Mum. “Maybe it had a mirror or something.” she suggested. “Like this?” Julia said, pulling out an old framed mirror mounted on a stand with a couple of small wooden drawers. Mum picked it up and had a closer look. It has four pegs on the underside and she placed it on the desk and they slotted into the holes perfectly. “It's a dressing table.” Julia noted. “It is.” Mum agreed. “It'll still do for a desk though.” she said, suggesting that my pens and pencils could go in the little drawers. We filled the car and headed off to the tip. On the way back we called into a pie shop and grabbed some lunch. Afterwards, Mum and I manhandled the desk up to my room. Julia followed with the mirror which I suggested wasn't needed, but both Mum and my sister said it should stay. “Well you need a dressing table as much as you need a desk Love.” mum replied. “I need a desk, not a dressing table.” I claimed. “You will when you start year ten.” Julia stated, reminding me that both girls and boys have to wear make-up for school from year ten onwards. “That's ages away.” I stated. “It's only eighteen months.” Mum retorted. Having spent to morning and early afternoon clearing the dusty garage, both my sister and I were in need of a shower and a change of clothes. I returned to my room wearing my bathrobe and found Mum giving my 'desk' an application of furniture polish. “It looks as good as new now.” she said. Apart from a few light scratches it's in pristine condition. The top and drawer fronts have some intricate marquetry and the legs and mirror stands are all scrolled. It's both elegant and feminine. I opened my underwear drawer to grab a clean pair of knickers, but the drawer was empty. “I've put them in here.” Mum told me, opening the drawers on the side of the dressing table to reveal one with my knickers in, one with my bras and one with my socks inside. She took the liberty of handing me a pair of knickers and one of my sisters old training bras. “Oh do I have to wear a bra mum?” I asked in a whiny voice. “More girl stuff!” I abruptly interjected. “I do.” Mum replied. “I wouldn't be at all surprised if your old school adopts educational petticoating within the next two or three years.” she suggested. I spent the rest of the day wearing my sisters old long sleeved CND T shirt and a knee length denim skirt. On my feet I wore white ankle socks and my trusty old trainers. In comparison to my boy clothes the outfit felt uncomfortable, but compared to my school uniform the longer casual skirt and boyish top felt OK. I think I preferred yesterday's shorts and leggings though. Over the next few weeks I spent less time at home wearing my old clothes and more time wearing my sister's cast off's. Given the choice I prefer the casual styles but that doesn't stop Mum from putting me in something pretty once or twice a week; the ivory button back blouse with oodles of lacy trim being a garment that I particularly despise. I had a private moan to my sister about some of the outfits Mum chooses for me. “Why can't she just let me wear what I like?” I asked. “Why not? The Prom's only a week away.” my sister said. Julie opened her wardrobe and it was crammed with a resplendent display of skirts, tops, dresses and frocks. “I've not got many to choose from.” she said as she pulled one out. “You could have fooled me!” I said as she held a candy pink dress against herself. She told me that this is the dress she'll be wearing to her Prom night and offered me the chance of trying it on. “Er... no thanks... it'll look nice on you but it's a bit too pink for me.” I replied. “Nah, they're all just dresses apart from these three.” Julia replied, pulling out the blue dress with pink flowers and holding that against herself. “That'd be OK without the flowers.” I admitted. The deeper, bolder shade of blue was easier on my eyes than the pale blue. “Oh I don't know.” Julia said as she turned me around. “Really you should have worn your pale blue bra with it.” she added as she fastened the zip for me. “Does it matter?” I asked. “No one can see it.” I said as I looked down at the sky blue dress that seemed to hover weightlessly around me. “I wondered what you two were up to but I never expected this!” Mum exclaimed as we entered the lounge. She smiled a beaming smile at me as she stood up and asked me to turn around. “It's a good job you're both about the same size.” she said, before telling me how nice and pretty I look. “I didn't say that!” I insisted. “No but you did say that you didn't like the pink one or the flowers on the other blue one.” Julia reminded me. “I know but I don't was a dress for my birthday.” I whined. I'd been hoping for something cool like a digital watch or a new bike or... anything but a new dress! Whether that's true or not, it's the present that matters, and pink is most definitely for girls. “Have you bought it already?” I asked. Mum grinned and nodded. "But I though I was going to choose it." I said. My mother said that she'd seen the 'perfect' dress so she went ahead and bought it. "I hope you like it." she smiled. "And I'm sure you'll look absolutely lovely in it." she added. “I hope it's not really prissy like in the photos.” I said, recalling all the puke inducing styles which most of the boys wore at last years Prom. “Well it is a party dress, so by definition it will be a bit 'prissy'.” Mum told me. “If it wasn't it'd just be a dress.” she added. I tried to prise some details out of her, in particular its colour, but my mother kept mum and I simply had to wait and see. I mumbled something about wishing I'd chose my own and Mum said that it wouldn't be much of a surprise if I had. My big day arrived and I went to school sporting a brand new digital watch; a G-Shock one no less... although it is a Baby-G in lilac, but even for a girl's watch it's still chunky and cool and I was as proud as punch. I went upstairs, opened the door to my room, looked at my bed and my heart sank. The dress that awaited me can only be described as too girlie for most girls. My mother appeared behind me and asked, "What do you think?" I gulped and looked up at her. "It's too prissy Mum... people will laugh at me if I wear that." "Of course they won't." my mother assured. "...and there's no such thing as too prissy." she insisted. I was speechless. Absolutely speechless. Mum showed me that pair of white lacy tights she'd bought, and the pair of pale pink sandals, and a pink & white stripy head band with big floppy bow on it. "And look at this... isn't it lovely?" she said, drawing my attention to a small bunch of pink and white flowers in a vase on my chest of drawers. "What's that for?" I asked. "It's your posy." Mum told me. "Boy's carry a posy and girls wear a corsage." "Of course." she grinned. "And if you'll look on your dresser..."
I looked at my dressing table and saw a small pink handbag. Mum told me that she'd bought me a few bits and bobs which she'd put inside it; namely a lipstick, some powder, some eye shadow, eye liner, mascara and small vanity mirror. After a light snack and a long shower, I sat in my prissy pink prom dress whilst Mum applied my make-up. she warned me not to rub my eyes or my mouth, otherwise I'd ruin it. She had me apply my own lipstick, which I dropped into my handbag as I'd need to reapply throughout the course of the evening. I felt like such a prannock as I descended the stairs with my little handbag hanging from my wrist and my posy held in a trembling hand. Julia said I looked beautiful, but I could tell that she was thanking the lord that she wouldn't be wearing such a prissy outfit on her Prom night. Mum drove me to school for 6pm and said she'd be waiting at 8pm when the prom ended. Out of all the boys in my year, I reckon mine was onme of the worst dresses of the lot, although i did spot a couple that i felt were worse than mine. Of course all the teachers and girls said I (and the other boys) looked lovely, but as far as I could tell, most of the boys looked like they'd rather be somewhere else wearing something much less dressy. We were all encouraged to participate fully, so we danced with the girls, clapped and cheered at the presentations, tucked into the buffet, danced some more and finally, after a long two hours, the event was over. Mum asked me if I'd had a nice time and I said I had, although I hated almost every second of it. "And did they tell you how nice you look?" "See I told you no one would laugh." Mum said in a triumphant tone. "What were the other boys wearing? Did they look nice too?" "I guess." I replied. I recalled all the dresses the other boys wore. Most I'd have rather worn than this and only a small handful i felt were just as bad or worse. "Mum?" I asked. "Can I choose my own dress for next year's Prom?" I asked. I think I would have enjoyed going to that school, however I am a bit surprised that the boys wear a different colour skirt to the girls. Since equality is the buzz word, they should be identical. Matthew should be allowed to choose his own prom dress though. DJ, thank you for another great story on one of my favorite subjects being, how to bring the best out in any boy. I know from previous comments about the subject “EP Schools” is a nonexistent phenomenon (still). But the way you describes it in your writings makes it feel so real, so it is hard to accept, it is pure fiction. Have you ever considered suggesting to the education authorities, that it could be worthwhile to run some test on this subject, to see how it would work in real life? I am sure, with you as a consultant; a lot of teachers will back you up and be happy to participate in the test projects. Another excellent story i had to laugh when i saw the dress just what a typical mother would do.